Why is Wednesday called Wednesday? If you are a devotee, you will go to a temple. But if you go to a temple, are you a devotee? This is a question that I often ask people who are obsessed with ritualism and who justify imposing this ritualism as a way of evoking devotion in their children. What they end up instead is creating children who are addicted to ritual, who are conditioned to fear the consequences of not performing a ritual correctly, who find comfort in the rhythm of the ritual, who are unable to fathom the purpose of the ritual but they are certainly not devotees. The good thing is that by forcing children to follow rituals, parents ensure the ritual is transmitted over generations, albeit only as hollow shells of choreographed performance, with no meaning attached to the action, and with little understanding. This is the dilemma of behavioural science which fundamentally assumes behaviour shapes belief: if you are polite, you become respectful; if you actively listen to your colleagues, you genuinely become interested in what they have to say; if you wear the correct clothes, people do take you seriously. But they do, don’t they? You can see how in 5-star hotels you are treated differently when you wear better quality clothes, when you speak with an accent, when you come in an expensive car or are seen using an expensive mobile. People do respond to the external manifestations: a beautiful man or woman does get more interest during an interview, a person who keeps using words like ‘collaboration’ and ‘team work’ is assumed to be a better leader. Looks matter. We are encouraged to mimic successful people. The more you mimic the more chances that you will succeed. We are told to ‘benchmark’ ourselves upon them; benchmark being a nicer word than copying. There is a Gujarati story based on the Ramayana, told to me by a very respected member of the business community that struck me as rather significant in this world of mimicry and benchmarking. Ravana was determined to seduce Sita, wife of Ram, who he had abducted and kept in his island-kingdom of Lanka. So he took various disguises to influence her. Like the form of a god to advise her, or a demon to frighten her. None of these worked. Finally, he took the form of Ram himself. No sooner had he done that, he was filled with genuine empathy for everyone around him. He wanted to give back the kingdom of Lanka back to its founder, Kubera, his elder brother, who he had kicked out long ago. 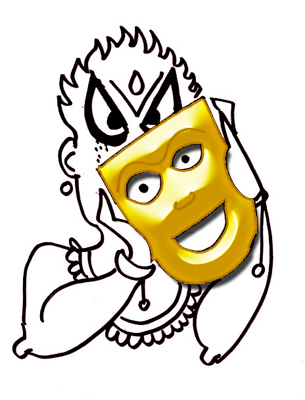 Terrified of these feelings, Ravana gave up his plans to pretend to be Ram. We hope that pretending to be someone else, behaving like them, will make us think like them. At a lecture somebody said, when Steve Jobs was asked why was he rude to his employees, he allegedly answered that his impatience and demand for perfection enabled him to create the iPad. Here cause and effect have been confused. The assumption is that those people who are rude are also perfectionists. But there are many perfectionists who are nice people and many rude people who are clumsy and imperfect. As humans we are obsessed with finding reasons and often equate certain concurrent habits of leaders as the cause of their success. The punctual man is successful or the efficient man is successful or the well-dressed man is successful or the boorish man gets his way or the gentle man gets his way. But is that true? Or is it that it is easier to mimic punctuality/efficiency/dress/boorishness/gentleness and so we equate that with success? Missing in all these conversations about mimicking habits is the idea of context, a sensitivity to who is in the room, a genuine curiosity about what is going on, and what needs to be resolved. Our ability to adapt to the ecosystem and get the other to do what we want, hopefully nicely, otherwise nastily, has less to do with habits and more to do with sensitivity, skill at responsiveness. No one really knows the formula for success. Even successful people often find it tough to repeat their success since markets are always changing and complementary talent is not always available. We work with what we know, we work with what we learn from others, but eventually we must appreciate that every problem is unique and no solution is really standard. That is why we need people to solve them, not machines.